Portable from car to car. 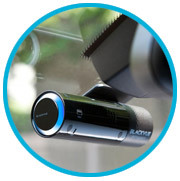 While some car cameras mount onto the dashboard of your vehicle, the vast majority are fixed to the windscreen with either a suction or adhesive mount. Both methods are easy to install but offer different functionality and usability. Suction cups can be easily placed, removed and repositioned to help find the optimum viewing position. They also allow the complete dash cam unit to be removed, either for security or to be transferred to another vehicle. Permanent mounts affix to the windscreen with adhesive pads which offer less flexibility, but are usually more compact and discreet brackets that the car camera fixes to. These adhesive mounts can of course be removed, and are often supplied with replacement adhesive pads, but they're designed to be a longer-term mounting solution. Whether or not you choose to leave your car camera in your vehicle permanently is a matter of personal choice, but with many cameras offering parking protection and featuring security LEDs, the need to detach the mount isn't always pressing. To secure your possessions in your car, you can of course just remove the camera from the mount leaving the mount attached to the windscreen. Then, either take the camera with you or lock it away. No matter which type of mount you use, it's important to note the positioning of the camera and to be aware of the legality surrounding where it is installed and how it impacts the drivers view of the road. The Ministry of Transport has strict guidelines regarding the positioning of windscreen 'obstructions' and an incorrectly installed camera could lead to an MOT failure. In short, they deem that objects encroaching more the 10mm into zone A (the 290mm wide area directly in front of the driver) or 40mm into zone B (the rest of the windscreen swept by wiper blades) would be a reason for rejection of a valid MOT certificate. Source: Vehicle & Operator Services Agency (VOSA) - MOT Guide and Inspection Manual for Classes 3, 4, 5 and 7 Vehicles. Also, Government legislation dictates that poorly positioned cameras could be deemed as 'dangerous' under the Road Traffic Act 1988. Chapter 52 states that when assessing dangerous driving "regard may be had to anything attached to or carried on or in [the vehicle] and to the manner in which it is attached or carried". By making sure that your camera is mounted in accordance with the Ministry of Transport guidelines above, you can ensure that the drivers view in not impeded. Consideration must also be given to the appropriate positioning of dash cams which feature LCD screens as the Road Vehicles (Construction and Use) Regulations 1986 states that "no person shall drive, or cause or permit to be driven, a motor vehicle on a road, if the driver is in such a position as to be able to see, whether directly or by reflection, a television receiving apparatus or other cinematographic apparatus used to display anything other than information a) about the state of the vehicle or its equipment, b) about the location of the vehicle and the road on which it is located, c) to assist the driver to see the road adjacent to the vehicle or d) to assist the driver to reach his destination". 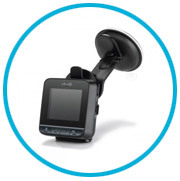 However, most car cameras with screens offer the option to turn them off or fold them away, as with the SmartCam 2 HD. In summary, car cameras are designed to be installed in a prominent position in your vehicle in order to capture a clear view of the road ahead. However, consideration must be given to where they are positioned so as not to obscure the driver's view in such a way as to be deemed as dangerous by the legislation outlined above. This consideration is equally important for all window-mounted devices such as Sat Nav units. Most car cameras are ideally mounted behind the rear-view mirror, to the passenger's side of the vehicle. This places them in an elevated position with a clear view of the road ahead while not being visible to the driver and therefore not interrupting their view.